The Waterfront is a district of the Imperial City that houses the Imperial City's harbor. Ships coming from the Topal Bay sail through Leyawiin up Niben Bay to reach Lake Rumare and the Imperial City's portside facilities. The Waterfront serves as headquarters for the Imperial Trading Company which also maintains a large warehouse on-site. The dock is partially encircled by a large wall. A small bridge connects the waterfront to the lighthouse and City Isle. Most of the residents living on the waterfront are poor and live behind the wall in mediocre shacks. One of the shacks can be purchased from Vinicia Melissaeia. The surrounding residential area is considered the most depressing and dangerous area of the city with the heavy presence of thieves in the area. Members of the Watch will mention the place isn't a nice neighborhood. ^aWill move to Leyawiin after the quest May the Best Thief Win, but will return after the quest Lost Histories. 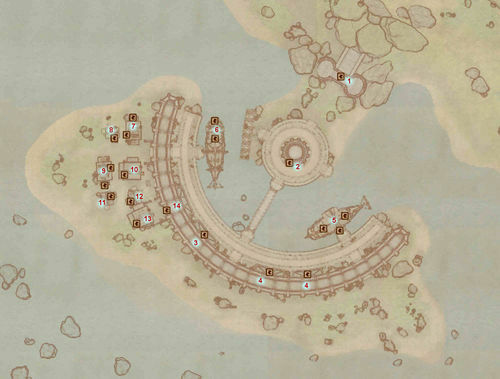 ^bWill leave the Imperial Waterfront after the quest, The Elven Maiden. ^cOnly appears during the Dark Brotherhood quest, A Watery Grave. ^dOnly appears during the related quest, An Unexpected Voyage. This page was last modified on 26 February 2019, at 08:28.